“Many candidates have the math and business aptitude, but Jeff’s attitude is what stood out,” said Brent Carr, vice president of actuarial and data analytics for Nautilus Insurance. The company specializes in providing commercial property and casualty insurance within the excess and surplus lines industry. “Jeff came across as a very genuine person – confident yet humble,” Carr said. The actuarial science degree at ASU is one of the only offered in the Intermountain West. Although many people don’t know what an actuary is, a recent survey by CareerCast ranks it as the best job in the United States because of its high pay, low stress, robust hiring outlook and healthy work environment. Actuaries put a financial value on risk, such as the chances of a hurricane destroying a home or the long-term liabilities of a pension system. While a student at ASU, Durham was president of the Actuary Club, which offers many opportunities for students. 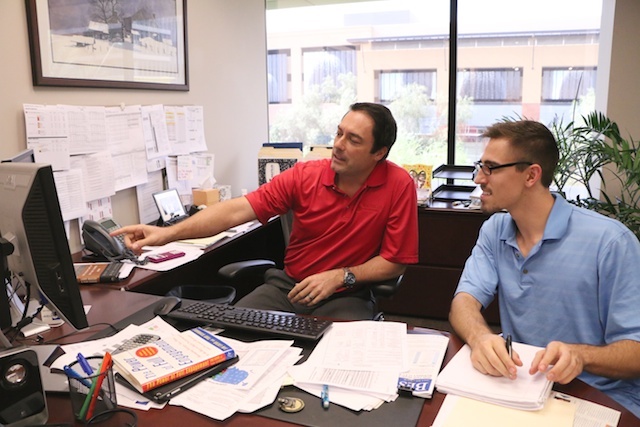 “The Actuary Club at ASU allows you to meet professionals, shake hands, ask questions and engage them,” he said. A line on Durham’s resume garnered some attention from Carr and his fellow interviewers: "Maximized efficiency to increase sales while maintaining high level of service." Carr was impressed with this creative way to phrase a waiter job when applying for an actuarial position. “We want people who are not afraid to speak up, are comfortable in a group environment, and are strong team players. Jeff’s got all that — personality, confidence and charisma,” Carr said. Jelena Milovanovic, professor of practice and actuarial science program coordinator, knew Durham would quickly land a job in the competitive actuarial field. “Jeff is not only a diligent student but also a great role model. He passed the first two actuarial exams within a month of each other, setting the bar high for others to follow," she said. Students must pass a series of professional exams to become credentialed actuaries. While at ASU, Durham passed his financial mathematics and probability actuarial exams. He recently passed his financial derivatives exam with the support of his company. Carr agrees that this is one way for companies to stay competitive. “The best employers, like Nautilus, will offer a competitive and financially rewarding study program. It’s unique to the industry,” he said. In addition to preparing students for exams, ASU’s actuarial science program provides opportunities for students to meet face-to-face with top employers in the industry with events like the annual actuarial career day. As a new employee in the actuarial profession, Durham had heard he might have to wait as long as six months before he would really start contributing to his company. He was surprised that during his first week on the job, Carr asked him to prepare a rate review exhibit for a client meeting. “I was pretty excited that my work was already being used. I was happy to contribute and help my teammates out right away,” he said. Durham said the education he received at ASU helps determine how he thinks about things, and is actually useful. After a meeting in his first few weeks at Nautilus, Durham came up with the idea of putting together a break-even analysis based on net income. “And that was a tremendous insight for somebody that’s only been out of school for a month,” explained Carr. Durham is excited for his future at Nautilus. “The work here is not necessarily easy; it’s definitely thought-provoking and requires you to really think about what you’re doing, which is nice because I’ve always been of the mind-set that you should work not necessarily as hard as you can, but as smart as you can,” he said. After battling a troubling home life, bulimia and living paycheck to paycheck, Cindy Wong decided to chase her dreams of getting educated and helping to educate others. Editor's note: This story is part of our back-to-school spotlight on notable incoming students. The series will run during the first two weeks of the fall semester. Read our other profiles here. Domestic violence and substance abuse in the home were but a few of the issues she has had to tackle. The 36-year-old Wong, who comes to ASU this fall as a transfer student from Mesa Community College with a 4.0 GPA, will major in elementary education with a focus on bilingual education/English as a second language at ASU’s Mary Lou Fulton Teachers College. She is the recipient of the Emma May Patton VanBockern Scholarship, which was established by private support to provide financial assistance to students over the age of 30. The scholarship will enable Wong to not only attend ASU, but also provide her with a full year of student teaching. The graduate of North High in Phoenix said she was “lost” during her teen and early adult years as a result of a tumultuous childhood. So she moved to Las Cruces, New Mexico, and enrolled in Dona Ana Branch Community College, where she eventually received her associate of arts degree. After 12 years working as a paralegal, she decided it was time to pursue her dream of becoming a teacher. In 2013 she attended Mesa Community College, where she completed an honors project of creating a STEM-based demonstration for a kindergarten class called “Earthquake in the Classroom,” which teaches concepts of civil engineering. She also taught “Music Masterpiece” to second- and fourth-grade students, introducing them to such classical musical artists as Johann Sebastian Bach, Ludwig van Beethoven and Frederic Chopin. Wong’s goal, after she graduates in 2017, is to improve the quality of education for all students regardless of socioeconomic class or background.